I recently came across this photograph that shows my first garden. 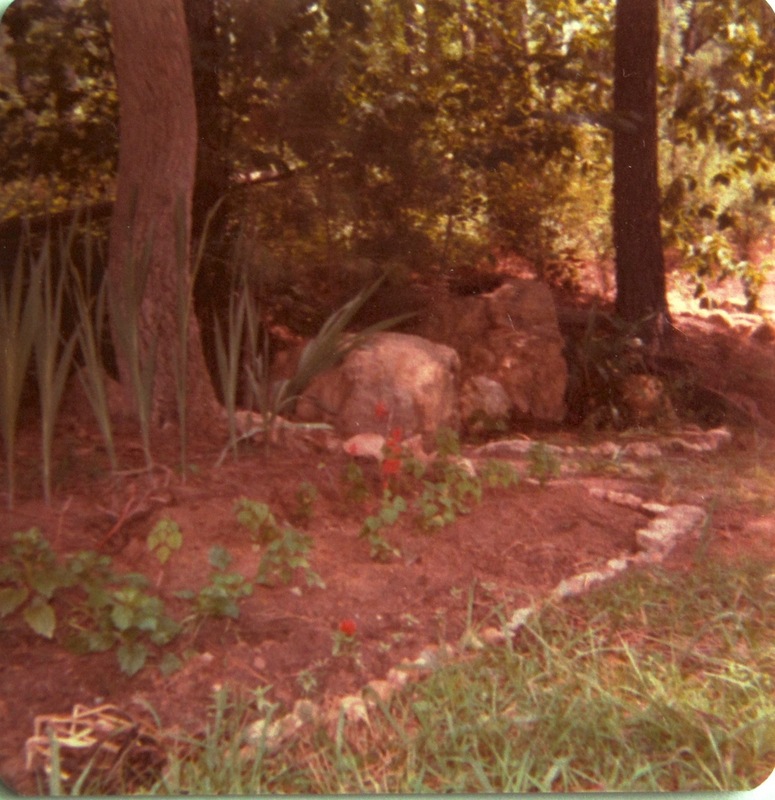 The same summer I was married I planted this little flower bed at the very edge of our property near the driveway. Silver bells and cockle shells and pretty maids all in a row. Or in my case, a back row of gladioli, two rows of red salvias, and a front row of zinnias, all meticulously outlined in small stones collected from around my yard. Both gladiolus and zinnia were well known to me, but the red salvia was not and it seemed terribly exotic. These little plants were a rectangle of joy that summer and so looking back at it now, I have to say this was quite a successful garden. A year before our marriage my husband had bought a small house on a dirt road, down in a valley on a one-half acre, heavily wooded lot. The land was once farmland, but had returned to young pine forest by the time our house was built four years earlier. The trees were mostly loblolly pines and unfortunately, over the years we learned a lot about how freshly broken pines smell after ice storms and hurricanes. Long after this photo was taken, the sweet gum tree visible on the left became a Hurricane Fran victim. The resulting light that streamed in after the tree was removed brought us an interesting surprise—after nearly two decades of living there a yucca plant bloomed for the first time in this little corner. That yucca, discernible In the middle right of the photo, lay at the base of a large pine. It was planted before we had moved there by Dr. Harold, our neighbor who owned the adjoining property. His wife’s first name was Fern and perhaps to honor her or just because he liked ferns, he also had dug up ferns of some unknown type and placed them, earth and all, atop these two tall stones, where they thrived during our years there. Dr. Harold had a deep love of the land and often walked his property and the surrounding woods with a beautiful English Sheepdog and later, his Golden Retriever, Lance. Though only three miles from town, my newly married self felt isolated and lost on this land “out in the country.” I did appreciate the azaleas and the many fine native dogwoods growing there, but being unused to anything wild, I did not even recognize what poison ivy looked like. Thankfully a wise friend finally took pity on me and announced one day she was coming over to walk me around our property to point out the poison ivy, so I could know what to avoid. It took a while but we eventually managed to get that pesky plant under control. There were too many trees in my opinion and the soil—in addition to being covered with tree roots, the soil was heavy clay, quite opposite the rich, loamy soil of my parents’ vegetable garden. The first year we were married my husband and I used large (and heavy) stones picked up from along nearby roadsides to create paths and to delineate islands around groups of trees. At the sunniest edges of these islands I tried to grow flowers, but gardening was not easy for me in this shady location. Everything I wanted to grow needed sun. Though I did not consider myself a gardener at this time, somehow the few sunny spots in our yard soon became flower beds. They were mostly filled with irises that had been passed along by my across-the-street neighbor, Henrietta. Many years later when enough trees had fallen to allow plenty of sunlight through, I decided to turn the entire front yard into a garden with islands of perennials and these irises were the starting point. The garden I created at that time is still my favorite. By that point I had learned enough to hire someone to bring in lots of planting soil and compost to form raised beds. No more scratching around tree roots in hard clay. The year before my good friends and accross-the-street neighbors, Bill and Cecy, had made a wonderful garden in their back yard, exuberantly full of shasta daisies and yarrow, among other things They had started with loads of compost recycled from the town’s food waste, so I took a cue from them. When Janice, my friend who earlier had taught me how to tip-toe past the poison ivy, saw the beginnings of my perennial garden, she dropped off lots of ephemeral wildflowers and other natives, such as Monarda. I am not sure what sparked the idea to create that perennial garden. Over time I think I had become a gardener without being aware it was happening. In my memory it stands out as a respite from work and simply a beautiful place to busy my hands and free my mind. I was fortunate to have a true gardening mentor, though when she was living, I did not know to think of her in such terms. Through the years my mother’s cousin, VIrgie, shared dozens of plants from her garden, including sweet shrub, spirea, Turk’s cap lily, phlox, tradescantia, everlasting sweet pea. When we moved to our current home many of Virgie’s plants came with me. It was the wrong time of year to be able to bring Janice’s ephemerals, but her Monarda came along and so did Henrietta’s irises. Sadly my digital images of my previous perennial garden were lost during a painful hard-drive crash. I am still hoping to come across a printed photograph of it sometime when I take time to go through my boxes of pictures. For now I remember it circuitously by looking at this image of my first little garden near the driveway—the beginnings of a love of gardening. This entry was posted in garden and tagged garden mentor, gladiolus, pass-along plant, red salvia, zinnia on August 23, 2014 by pbmgarden. Yes, and I like to think the gardener has too! It will be a blessing for your family to have this chapter of your gardening “history.” You have caused me to look back as well and, once again, recognize who little I knew when first I dug. Now I will have to go through all those photographs for inspiration. Thanks, Susie, for a delightful account. Glad you enjoyed this John. Hope you’ll share your own gardening beginnings once you go through those photos. What a great story, I hope you’re able to find a few more pictures. Sometimes I think the first gardens you make are most special and have a simple charm that’s lost when you overthink it. A nice set of neighbors sure helps doesn’t it? Thanks Frank, I’ll keeping looking for more pictures. I agree those first gardens are special–innocently easy and gratifying. Oh how i loved reading this post…probably because your beginnings echo my own, right down to the full-on perennial front yard and losing the pictures beyond what exists in memory. Lately I’ve been thinking about my old garden quite a bit…i guess we all do. Glad you enjoyed reading about my first little garden. Great that our stories run parallel. I’d be interested to read about yours sometime, especially since you’ve been reflecting on it lately. I love the ‘How I built my garden’ kinds of books. My bookshelves reflect this fact. Your first garden falls right into that category, which means I enjoyed this post a lot. My garden photo albums take up space, but glad I have them when I read about your computer crash. Thanks for sharing…as usual. Glad you enjoyed reading this Stepheny. Hang on to those photo albums. What a lovely post Susie! It’s good to look back at how it all began, and to remember those who helped too. I also have helpful neighbours and friends to thank for many of my first plants. Thanks Cathy. Finding that photo brought back a flood of memories. It’s nice to have those connections of plants and people I think. I really enjoyed this post. Our first garden was the backyard of a three flat – a rectangle of dead grass surrounded by a chain link fence. We grew morning glories on the fence and marigolds along the margins. Our landlord was thrilled. Thanks, glad you liked it Jason. I totally get how exciting your first garden would have been. There is something compelling about growing things. What a lovely post, It is really interesting to look back on how one started gardening and how friends helped along the way. The story of your garden is an important part of the story of your life. Thank you Chloris for journeying down memory lane with me. I am surprised looking back and realizing how much that property shaped my world. Finding old photos brings back such happy memories don’t they! I only began gardening seriously when we moved here nearly 25 yrs ago, it’s good that you have photos going back to the beginning and that you had such good neighbours to help get you started. Yes, Pauline, finding the photo was fortuitous. I enjoyed reminiscing about some special people. You’ve created a noteworthy garden. Isn’t it great to find photos like this? I occasionally find pictures of things I was so proud of when I made them, and there are so many happy memories. It is great fun and I think it is important to take a look back once in a while. I didn’t know what to expect when I read your title; then I read on with great pleasure getting to know you better by your sharing those early gardening experiences. I think you did well to create any kind of garden in the wooded garden so I think you must have the gardening gene. I do hope you find some more images of the garden to share. Thank you Christina. I didn’t know when I started writing this post that so many memories were going to spill out. Initially I just thought I’d post the picture with a simple explanation, but that’s one of the fun things about blogging that applies to gardening too–the opportunity is there waiting for us to take another step. What a great post. Makes me think back to my own garden and gardener evolution. It’s fun to look back. Thanks Stephi. Yes, fun to look back and instructive also. In hindsight, there were many lessons learned along the way that would help me with my current garden. Lucky for you and me, our first starts didn’t discourage and we’ve learned to do better! My first garden was a row of marigolds, what a funny memory. Thanks for sharing. Bet your row of marigolds was full of cheer Marian! I have learned a few things but the more I learn the more I know there is to learn. How wonderful to have some pictures and lots of memories of a beginning garden…I have barely any pics as I never thought to take them when I was beginning..and sadly the people who bought our house tore it all out. Sad to leave a garden and see it no longer maintained. Same thing happened to my last garden. Yes, gardening is a journey indeed–always something new to learn. Quite a journey….and, for a true gardener, it never ends. There are lots of twists and turns along the gardening journey. I have come to think of myself as a gardener after all these years, but hesitate to use “true” gardener–I think there must still be a secret ingredient I’m missing. But I’m looking.